August 28, 2015 August 28, 2015 ~ Trevis Dampier Sr. So it’s Friday and about 85 degrees here in the Bay Area and I am hungry. I have been eating salads, turkey and chicken sandwiches all week and it is time for me to sink my fangs in some well deserved beef. Anytime I am ready for a good dose of red meat, I think of a hamburger. And when I think of hamburgers I think of Armadillo Willy’s. So Willy’s has all kinds of barbecue delights on the menu. From sausage, to ribs, to tri-tip, pulled pork etc. All of the barbecue favorites you can think of. 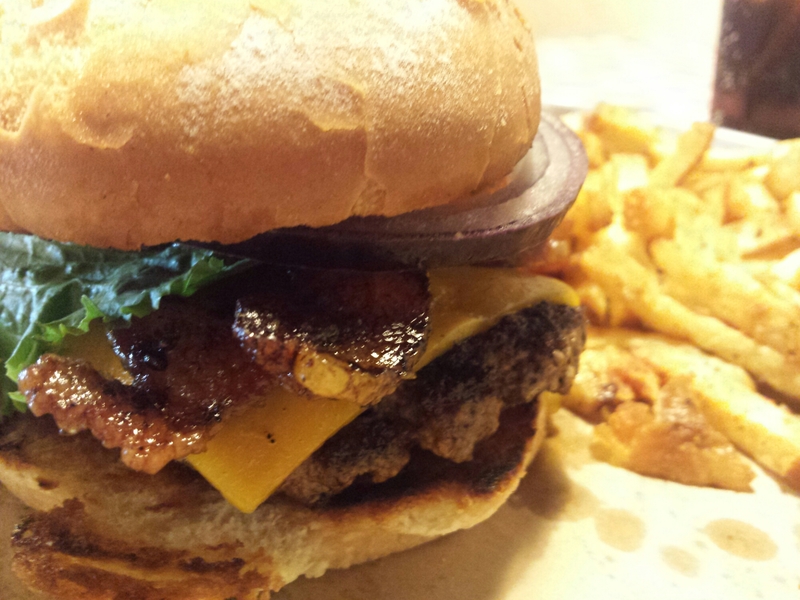 They also have a great burger selection which included my favorite – The Bacon Cheeseburger. They describe it as a Flat Iron Cheeseburger (Fresh hand-formed Certified Angus Beef 100% Chuck. Flat Iron grilled. Mayonnaise, mustard, lettuce, tomato, and red onion) with their special Double-Smoked Brown Sugar Bacon. Just writing about this gets me excited! The burger is cooked at a perfect medium and bun grilled perfectly to give you a slight crunch with every bite. You can taste the smoke from the bacon and smell it before you even take a bite. It is a thick sliced bacon that is just bursting with rich sweetness and smokiness that is to die for! I would love it if they had a BLT there. I’m sure if they did that then they would sell out of their bacon before the end of the day. It is that good! Each bite is a combination of smokiness, sweetness with the succulent bacon and amazingly cooked Angus beef! True live action eating! Good job Willy’s! If you have never tried Armadillo Willy’s then I suggest you run on in there fast! I promise you that you won’t be disappointed! < Previous Aroma that will put you in a Coma over at Scoma’s!! Next > Choose your roll and choose your blend at YukiSushi in Willow Glen!